An auxiliary wind propulsion system for a merchant ship has been given a type approval by classification society DNV GL. Marine technology firm Norsepower said the design certificate was for its 30 by 5 metre rotor sail. Two of these sails have been installed on the Maersk ship Maersk Pelican. 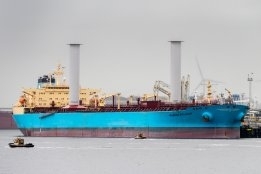 "The landmark certification means that vessels operating Norsepower's Rotor Sail Solution are technically capable of safely navigating 'all operational and environmental situations,'" the company said in a statement. Norsepower CEO Tuomas Riski said the move helps to build momentum towards "renewable wind energy propulsion systems at a scale that supports shipping's transformation to a low carbon transport sector".